William Morrow Paperbacks, 9780062388957, 400pp. In 1908, Jialing is only seven years old when she is abandoned in the courtyard of a once-lavish estate near Shanghai. Jialing is zazhong—Eurasian—and faces a lifetime of contempt from both Chinese and Europeans. Without her mother’s protection, she can survive only if the estate’s new owners, the Yang family, agree to take her in. Jialing finds allies in Anjuin, the eldest Yang daughter, and Fox, an animal spirit who has lived in the haunted courtyard for centuries. But Jialing’s life as the Yangs’ bondservant changes unexpectedly when she befriends a young English girl who then mysteriously vanishes. Janie Chang writes historical novels that draw upon family history for inspiration. She grew up listening to stories about ancestors who encountered dragons, ghosts, and immortals, and about family life in a small Chinese town in the years before the Second World War. 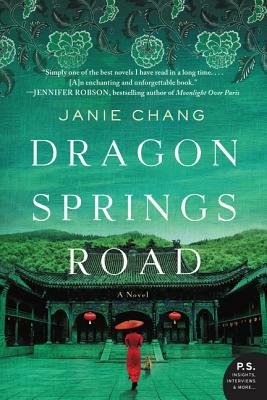 Her second novel, Dragon Spring Road, was released in January 2017. Her first novel, Three Souls was a finalist for the 2013 BC Book Prizes fiction award, one of 9 Canadian novels long listed for the 2015 IMPAC Dublin Literary Award. Born in Taiwan, Janie has lived in the Philippines, Iran, Thailand, and New Zealand. She now lives in beautiful Vancouver, Canada with her husband and Mischa, a rescue cat who thinks the staff could be doing a better job. “Janie Chang’s second novel is a remarkable read, brimming with magic and the grit of realism. . . . With this novel, Chang asserts herself as an exciting, relatable voice . . . that requires us to re-examine our relationships to place, identity, and ancestry.